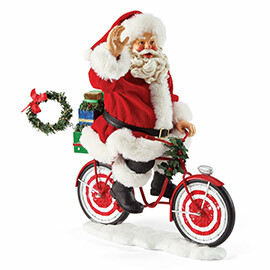 Possible Dreams Santa - "Merry Cruiser"
Home > Santas - Collectibles, Ornaments and Holiday Decor > Possible Dreams Santa - "Merry Cruiser"
Possible Dreams Santas are a collection of imaginative Clothtique Santas celebrating Christmas past, present and future. The magic of Clothtique is created by blending new technological expertise in porcelain, cloth and other materials. The intricate detailing, inspired brushwork and realistic accessories create this one-of-a-kind collectible. Size: 7 x 6 x 9"